A novel treatment for posterior blepharitis which involves the use of disposable wet wipes imbibed with a solution of terpinen-4-ol and hyaluronic acid (Hy-Ter®) as well as aloe, natural anti-inflammatories and antiseptics (Blephapad Combo; Novelty Technology Care, Milan, Italy) has been proposed. The aim of this study was to compare the efficacy and safety of treatment with Blephapad Combo with standard treatment. We conducted 4-week, open-label, randomized controlled study with a closed sequential design at the Magna Graecia University of Catanzaro, Italy in which patients aged > 40 years with symmetrical bilateral posterior blepharitis were enrolled. Each eye represented a single experimental unit. Patients were randomly assigned using a computer-generated randomization list to apply a reusable heated compress to the eyelid of one eye before cleansing the eyelid with the Blephapad Combo wet wipe (Blephapad Combo treatment arm) or to use the standard treatment of applying a wet and warm gauze to the other eye (standard treatment arm), twice daily for 4 weeks. The primary endpoint was the percentage change from baseline to week 4 in meibomian gland dysfunction (MGD) grading scale scores. Eighteen patients (9 men; 9 women) with a mean (± standard deviation) age of 66.9 ± 9.03 years were included in the study. Compared with the eye receiving the standard treatment, treatment with Blephapad Combo appeared to improve the MGD total score after 4 weeks of treatment (mean change from baseline − 29.9 vs. − 38.5%). The assessment of the investigators was that in 11 patients the eye treated with Blephapad Combo showed greater benefit, in two patients the eye treated with the standard treatment showed greater benefit and in four patients there was no difference between treatments. Blephapad Combo was well tolerated, with no serious adverse events (AEs) reported. Minor ocular AEs were reported in 44.4 and 38.9% of patients in the Blephard Combo and standard treatment arms, respectively. Treatment with Blephapad Combo was more effective than the standard treatment in ameliorating MGD in patients with posterior blepharitis. Minor ocular AEs events were equally distributed between the two treatments arms. To view enhanced digital features for this article go to https://doi.org/10.6084/m9.figshare.7862648. Posterior blepharitis is characterized by chronic meibomian gland dysfunction (MGD) and is a common condition in patients with eye discomfort or irritation . Meibomian glands are responsible for secreting the lipid component of the tear film to prevent its evaporation . Decreased or altered secretion of the meibomian glands are therefore the main causes of dry eye syndrome, with consequent instability of the tear film, inflamed and thickened palpebral margins, presence of palpebral crusts, foamy tear film, damage to the ocular surface epithelium and chronic blepharitis . Seborrheic dermatitis, rosacea or Demodex infestation (a common parasite of the microbial flora of the skin) can all be involved in the malfunctioning of the meibomian glands . As posterior blepharitis induces chronic inflammation that can cause permanent damage to the meibomian glands, treatment is recommended even in asymptomatic or mild cases. The Preferred Practice Pattern guidelines from the American Academy of Ophthalmology recommend the following treatments for blepharitis: warm compress, eyelid hygiene, antibiotics (doxycycline or other tetracycline topical and/or systemic) and topical anti-inflammatory agents . Daily cleansing of eyelids and cilia with warm compresses is essential for symptomatic relief of blepharitis, and routine application removes debris, softens thickened secretions, removes ciliary dandruff and cleans the eyelid margin [6, 7]. If an infestation of Demodex mites is suspected, daily lid cleaning with 50% tea tree oil and massaging of the eyelid with 5% tea tree oil ointment is an additional topical treatment option to resolve posterior blepharitis [8, 9]. The most active component of tea tree oil is terpinen-4-ol, which is the primary agent responsible for the Demodex killing effect of this oil . Recently, wet wipes imbibed with a solution of terpinen-4-ol and hyaluronic acid (Hy-Ter®) as well as aloe, natural anti-inflammatories and antiseptics (Blephapad Combo; Novelty Technology Care [NTC], Milan, Italy) have been developed for the treatment of blepharitis. The aim of this randomized contralateral-eye study was to compare the efficacy, safety and patient satisfaction of treatment with Blephapad Combo with standard treatment for eyelid cleansing in patients with bilateral posterior blepharitis. This was a 4-week, open-label, randomized controlled study with a closed sequential design using a diagram to map sequentially reported efficacy assessments and detect medium-sized differences between treatments at the 10% α level. The treatment with the better change was plotted sequentially; no marks on the plot were placed when a choice could not be made between the two treatments. The study ended when the plot line reached one of the diagram boundaries. 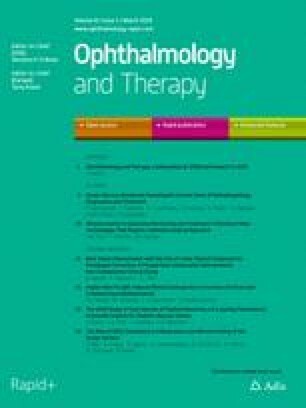 Patients were enrolled between May 2017 and January 2018 at the Ophthalmology Unit of the Magna Graecia University of Catanzaro in Italy and were included if they were older than 40 years and had symmetrical bilateral posterior blepharitis. Patients were excluded if they had received previous treatment with topical ophthalmic drugs (artificial tears allowed), had undergone ocular surgery in the last 6 months, were pregnant or breastfeeding, had a history of alcohol abuse or psychiatric disorders, had any cognitive impairment that could affect evaluation of patient preferences, had participated in another clinical study in the last month or had hypersensitivity to one or more components of the study products. In order to eliminate potential bias in the assessment of treatment efficacy, patients with different involvement severity between the two eyes were excluded. The study was conducted in accordance with the principles stated in the 1964 Declaration of Helsinki and its 2013 revision. The study protocol was approved by the local ethics committee, and all participants provided detailed written informed consent before enrolment in the study. Patients were randomly assigned using a computer-generated randomization list to apply the Blephapad Combo wipes to one eye and standard treatment to the other eye, twice daily for 4 weeks. Blephapad Combo wipes contain Hy-Ter® solution (sodium hyaluronate acid and 4-terpineol), aloe, natural anti-inflammatories and antiseptics. Participants were instructed to pour hot water into a regular glass, place the reusable pad in the water until the color turned from orange to yellow, indicating that the right temperature had been reached, following which they applied the heated compress to the eyelid for 3–5 min with a slight pressure; the procedure was completed by cleansing the eyelid margins with the Blephapad Combo wet wipes. Standard treatment consisted of applying a warm, wet gauze to the eye for 3–5 min. The primary endpoint was the percentage change from baseline to week 4 in the total MGD grading scale score. Secondary efficacy variables were patient preference, adherence and safety. At the initial visit (Visit 1), a complete ophthalmologic evaluation was performed. All patients considered eligible for enrollment in the study were scheduled for a second visit (Visit 2) after 2 weeks, at which time each eye was randomized to a treatment arm. During the 2-week run-in period (Visit 1–Visit 2) and after the patients had provided informed consent, investigators collected demographic data and medical history and performed a physical examination of each patient; in addition, the patients were instructed on how to properly apply the treatment according to the description in the Treatment section. Patients were given a diary to record any daily symptoms as well as any adverse events (AEs) associated with the therapy (i.e. itching, redness, soreness); they were also asked to grade the symptoms according to their severity (mild, moderate or severe) to enable evaluation of the change in symptoms during the follow-up visits. In the last examination visit (Visit 3), scheduled after 4 weeks of treatment, the patient was asked to indicate the preference for one of the two treatments and to return any unused products as well as the diary. During both Visits 2 and 3, the patients underwent a physical examination (for ocular and systemic AEs as well as efficacy measures), and photographic and infrared images of the eyelids were taken. These were evaluated using the MGD grading scale as described by Arita and colleagues , which assesses the following MGD parameters: lid margin findings of vascularity (score 0–3), plugging of gland orifices (score 0–3), lid margin irregularity (score 0–2), lid margin thickening (score 0–2), partial glands (score 0–3) and gland dropout (score 0–2). The scores were graded in all cases by the same examiner, and the total MGD score was calculated as the sum of the scores for each individual parameter. 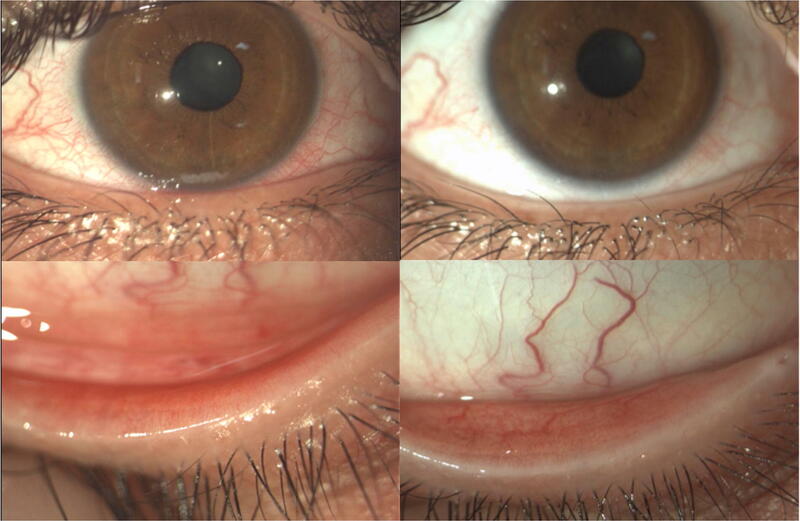 The first four parameters were evaluated using photographic images of anterior segments, while the last two were evaluated using infrared images of the meibomian glands. After the eyes of each patient had been evaluated, the treatment with the better change from baseline was plotted sequentially on a graph (Fig. 1), which recorded the more effective of the two treatments and was filled out sequentially. The experiment began in the square marked with an “x” in the bottom left corner of the chart, and then the outcome of each patient was plotted as soon as the results were known, according to the following rule: if the treatments led to the same outcome, nothing was plotted on the chart; if the standard treatment caused a better percentage change in clinical features than that of the study treatment, then an “x” was placed in the square to the right of the last entry on the chart; if the study treatment caused a better percentage change in clinical features than the standard treatment, then an “x” was marked in the square above the last entry on the chart. The diagram has upper, lower and middle boundaries. The study finished as soon as the plot of the trial results had reached one of these boundaries, at which point three possible conclusions could be drawn: (1) the study treatment was more effective than standard treatment if the superior margin was reached first; (2) standard treatment was more effective than the study treatment if the inferior margin was reached first; (3) there was no evidence of a treatment difference if the middle boundary was reached first. The closed sequential design detected medium-sized differences between treatments at the 10% type 1 error α. All descriptive statistics and figures were produced using SAS software version 9.4 (SAS Institute, Cary, NC, USA). Continuous data were summarized by the mean, standard deviation, median and minimum and maximum. Categorical data were presented by absolute and relative frequencies (n and %). The trial is registered with ClinicalTrials.gov, number NCT03301844. Nineteen patients enrolled in the study. Of these, 18 (mean age 66.9 years) were included in the analysis (Table 1). One patient was excluded due to suspected colon cancer, an AE that was not considered to be related to the treatment under study. Three patients were taking an anti-inflammatory agent at baseline, with one patient each taking aceclofenac, celecoxib and prednisone. Treatment with Blephapad Combo appeared to improve MGD compared with the standard treatment, with a greater percentage change from baseline in total MGD score after 4 weeks of treatment [− 38.5 ± 21.3% (min; max: − 78%; 0%) vs. − 29.9 ± 17.6% (min; max: − 67%; 0%)]. After 4 weeks of treatment, 11 (61.1%) patients showed a greater improvement in the signs and symptoms of blepharitis in the eye treated with Blephapad Combo (Fig. 2), while there were no differences between the two treatments for four (22.2%) patients and two (11.1%) patients showed a greater improvement with standard treatment. Based on the sequential design, treatment with Blephapad Combo wet wipes was assessed to be superior to standard treatment. Of the assessments made by investigators, 11 supported a higher efficacy of Blephapad Combo, two supported a higher efficacy of the standard treatment, and four indicated no difference between the treatments. At the final visit, the total MGD grading scale score had improved by 38.5% in eyes treated with the Blephapad Combo wipes and by 30% in eyes treated with the standard treatment. Of the 18 patients enrolled, 17 expressed a preference for one treatment over the other, with 12 (70.6%) patients preferring Blephapad Combo and five (29.4%) preferring the standard treatment (p = 0.071). Compliance with treatment was very high: 96.1 ± 8.8% (min; max: 64%; 100%) for Blephapad Combo and 94.2 ± 9.5% (min; max: 64%; 100%) for the standard treatment. No systemic AEs or serious AEs were reported. Ocular AEs were evenly distributed between the two treatment arms: eight patients treated with Blephapad Combo (44.4%) had at least one minor ocular AE, and seven patients receiving the standard treatment (38.9%) had a minor ocular AE (difference is not significant at p = 0.7353). Ocular AEs included dry eye, ocular pain, irritation, itching or discomfort, increased lacrimation, conjunctival hyperemia, ocular secretions, crusts on eyelid margins, blurred vision and madarosis (Table 2). The aim of this randomized, open-label study was to investigate the efficacy and tolerability of Blephapad Combo, a wet wipe imbibed with a solution of terpinen-4-ol and hyaluronic acid (Hy-Ter®) as well as aloe, natural anti-inflammatories and antiseptics that was developed for use in conjunction with a heated compress for the treatment of posterior blepharitis. The results of this study show that both Blephapad Combo compresses and the standard treatment (warm, wet gauze) resulted in clinical improvements from baseline following 4 weeks of treatment; however, treatment with Blephapad Combo was associated with significantly greater improvements in total MGD grading scale scores. The clinical improvement was demonstrated both by evaluating the morphology of the meibomian glands with photographic images (Fig. 2) and infrared analysis and by the treatment preference reported by the patients. Furthermore, Blephapad Combo wet wipes appear to be a safe treatment option for chronic blepharitis as the wipes were well tolerated and were not associated with any major safety issues; no systemic AEs or serious AEs related to the treatment were reported, and ocular AEs were evenly distributed between the two treatment arms. Most of the AEs recorded during our study are also common signs and symptoms of blepharitis; however, we have reported them among the AEs because it is impossible to establish whether they were caused by the underlying condition (e.g. lack of treatment efficacy) or by a side effect of the treatment. Posterior blepharitis is a challenging ocular disorder due to its prevalence, chronicity, and difficulty in managing it. Although several therapeutic options have been proposed to manage this resistant multifactorial disease, to date there is no definitive therapy . Standard treatment for blepharitis involves cleaning the eyelids with wet, warm gauze applied to closed eyelids for several minutes to remove pathogens along the eyelid margin and dissolve the secretions of the meibomian glands . Clinical improvement is often slow, and the most appropriate treatment depends on the underlying pathology; in addition, the role of Demodex mites in the pathogenesis of posterior chronic blepharitis should always be taken into consideration in both the diagnosis and treatment of the disease. Despite the fact that some form of heat therapy is the most suitable first-line treatment for blepharitis , compliance to treatment is often poor . Furthermore, the ideal temperature for treatment has yet to be elucidated and maintaining a temperature for the necessary amount of time can be difficult [15, 16, 17, 18]. To address these issues, several devices for eyelid warming have been developed [19, 20]; however, the often high costs and limited practicality of these tools have limited their wide-spread use in the clinical setting . The rationale for the development of the Blephapad Combo compress was to have a heat source that is quick and easy to prepare and which also allows the patient to easily identify the temperature of the compress. The compress changes color when it reaches a temperature greater than 43 °C, allowing patients to adequately heat the eyelid area prior to using the wet wipe. In addition, the substance in the compress releases heat slowly compared with a pad composed of only water. When the heated Blephapad Combo compress is applied onto the eyelid, it opens the occluded meibomian glands and allows the production of lipids necessary for a healthy tear film; following the use of the compress, the Blephapad Combo wipes are applied. These wipes contain terpinen-4-ol, the most potent ingredient present in tea tree oil , as well as hyaluronic acid and aloe, all of which have antibacterial and anti-inflammatory activities and have been shown to reduce the presence of Demodex mites in the eyelid margin and improve the signs and symptoms of chronic blepharitis [21, 22, 23, 24, 25]. Despite the fact that some of the recently developed therapies for blepharitis mainly focus on reducing Demodex infestation , to our knowledge none to date have used a warm compress followed by eyelid hygiene measures. The results of the present study show that the combination of both these treatments appears to improve clinical symptoms of blepharitis. Moreover, in our study compliance with this treatment was high (96%). One explanation for the high compliance rate in our study could be the relatively short duration of treatment (4 weeks). However, since compliance was high in both the Blephapad Combo and control arms, the most likely explanation is the well-known phenomenon of enhanced compliance by patients participating in clinical trials . There are a number of limitations to this analysis, most of which are associated with patient availability at the clinic where the study was conducted. To address this issue, changes between the experimental and standard treatment were plotted sequentially, a statistical technique that does not require a fixed sample size. The sequential analysis offers important advantages over the usual statistical procedures with a fixed sample size: (1) the data are analyzed as they are collected, reducing the amount of data needed to reach statistically valid conclusions and allowing for the possibility of stopping the clinical trial early during interim analyses; (2) the greater the difference between treatments, the fewer patients are needed to achieve statistical significance. 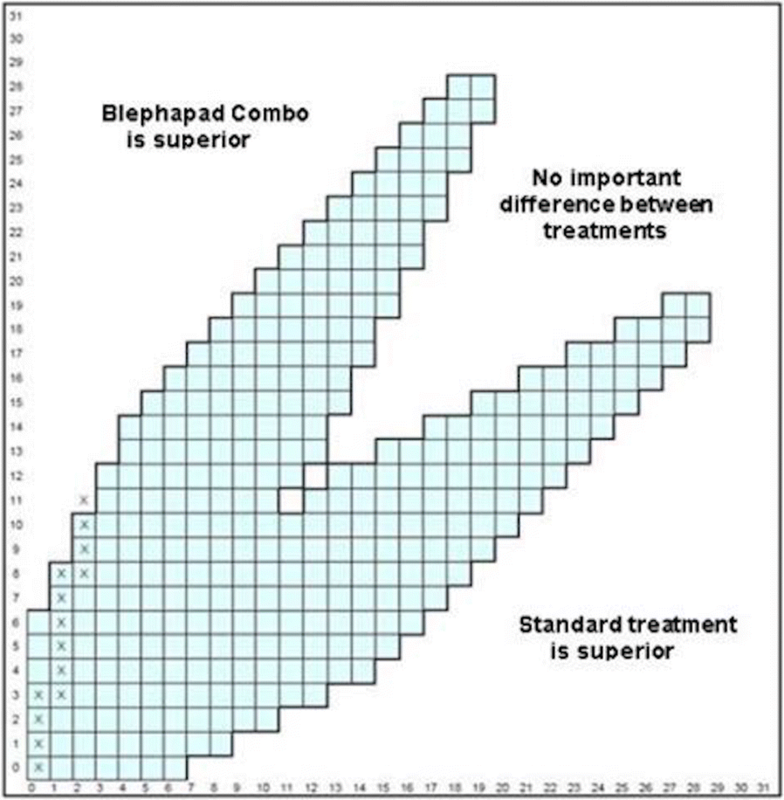 As seen with this analysis, using a sequential analysis design allowed us to show that Blephapad Combo was superior to standard treatment with a relatively small sample size. Treatment with Blephapad Combo was shown to be more effective compared with the standard treatment and to be safe in patients with blepharitis. Further studies with larger sample sizes are recommended to confirm our initial results; however, we were able to demonstrate a statistically significant result using a small cohort of patients because the closed sequential analysis enabled us to considerably reduce the number of cases relative to studies with a fixed sample size. The simplicity of use with Blephapad Combo was associated with high compliance to treatment, a fundamental requirement for treatments of blepharitis, which is characterized by frequent periods of symptom exacerbations and requires long-term therapy. This research was not financially supported by any specific grant from funding agencies in the public, commercial, or not-for-profit sectors. Article processing charges were funded by NTC S.r.l., Italy. All authors had full access to all of the data in this study and take complete responsibility for the integrity of the data and accuracy of the data analysis. The authors would like to thank Simone Tait of Springer Healthcare Communications who edited the manuscript before submission. This medical writing assistance was funded by NTC S.r.l., Italy. Vincenzo Scorcia, Valentina De Luca, Adriano Carnevali, Giovanna Carnovale Scalzo, Gabriele Piccoli and Donatella Bruzzichessi have nothing to disclose. American Academy of Ophthalmology. Preferred Practice Pattern: blepharitis. October 2011 revision. http://one.aao.org/CE/PracticeGuidelines/PPP_Content.aspx?cid=500cd9ca-173c-4c31-b6ea-a258e3549474. Accessed 6 June 2018.